Yes, we know, being a pedestrian or cyclist can be dangerous, but that won't stop us from driving however the hell we want, as long as this futuristic design never sees the light of day. 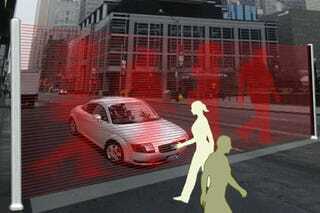 This new conceptual idea for crosswalks is a bit too i, Robot for us. Rather than just having pretty painted lines—this crossing would also include a plasma laser barrier that makes cyclists and anyone doing an Abbey Road impression more visible and helps avoid those nasty vehicular manslaughter charges. We wonder what happens if a vehicle were to cross the barrier?